Siam Place. 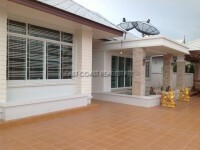 A quality village set along Siam Country Club Road in East Pattaya. Siam Place is a family orientated communal village with wide roads, pleasant greenery, and a great communal swimming pool and club house. This property consists of 3 bedroom and 3 bathrooms, all set upon 77Wah² (308sq.m) of landscaped private gardens. The private swimming pool is a real luxury to enjoy. Each room is air conditioned and the furniture will be sold with the house. There is a fully functional Western kitchen to the rear and the master bedroom has its own en-suite bathroom. The property also benefits from private off road covered parking. Owned in a Company Name.